Our small village is helping to keep this venerable tradition alive in the person of Bob Keyes (left), who succeeded the late Hank Kleinfeldt (below right) in 2013 as Mariemont’s official Town Crier. Our Town Crier is just one of many Town Criers who hold this title in North America. He is considered an officer of Town Meeting and his official duties include opening Town Meeting and leading the Memorial Day Parade. Hank Kleinfeldt took over from the late Ralph Smith (below right) several years ago. The Town Crier also dons the uniform to speak to groups about his position, and to preside over a few functions each year. The first Criers date back to biblical times and were advance men, sent into towns and villages by merchants to announce the next day’s sale of cattle, slaves, or imported goods. Once towns became more developed and the merchants remained as permanent fixtures, the role of the Town Crier shifted. Towns and villages hired them to call out the news of the day and keep the citizens informed. Along with the Lamplighter and Night Watchman, the Town Criers were an important part of daily life, particularly in England. With a call of “Hear Ye! Hear Ye!” these “men of good voice” would draw people together to hear proclamations, edicts, laws, and news of plague, victories in exotic lands, births and deaths. Much of the credit for Mariemont’s version of the Town Crier goes to Ralph Smith. The official wording used by the Town Crier and the authentic uniform he wears were researched and selected by Ralph after extensive study. The uniform is based on the look of a country squire. 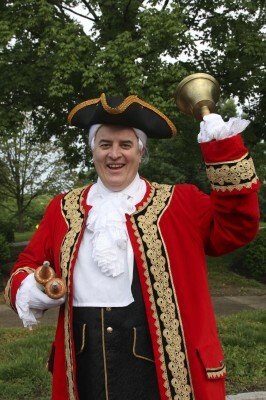 The tradition of the Town Crier is another unique aspect of life in the Village of Mariemont.